Link: oxford internet institute | webcast | home. For the FutureLawyer, and for LegalNetTourist, the Web provides the opportunity to be places where physical presence is impossible. In this case, attending a lecture on the future of the Internet by its acknowledged inventor, Sir Tim Berners-Lee, at Oxford, is one of those opportunities. You don't need to attend Oxford to avail yourself of this opportunity. Just point your browser, and download a media file, in a format of your choosing. Hey, wait a minute. This IS the future of the web. Link: Windows Live OneCare - Home. I suppose there is something to be said for a security software system that combines anti-virus, anti-spyware, and other security services, as well as automated back-up, with a Microsoft label on it. But, I remain to be convinced by Microsoft's announcement that it is going Live with Live One-Care. For $49 a year, you can "protect" up to 3 computers with an always on, always working, always in the system tray package of security services, including two-way firewall, virus protection and spyware protection. For the 70% of computer users who use nothing at all, largely because they are clueless or lazy, this is certainly far better than nothing. However, given Microsoft's reputation for security in the past, I am waiting to see if this service is worth the money. If you are willing to work a little bit, you can assemble decent computer protection for free. In addition, the best protection is a hardware router that protects you from outside-in attacks. Keep an eye on this site, and the comments. But, wait a little bit, unless you have no protection. If so, and you don't want to mess with your system, it may be worth it to you. Link: joegratz.net � Blog Law & Blogging for Lawyers: Kevin O’Keefe on the Business of Blogging. Perhaps the leading expert on law blog marketing is Kevin O'Keefe. This live blog from a conference where Mr. O'Keefe was speaking, by recent law graduate, Joe Gratz, is an example of the power of the Internet in the current world. This is being posted simultaneously at legalnettourist.com, since it is a perfect example of my vision of the future of Web 2.0 and the Internet. We can travel the world, getting information about events, all over the Web, and we never have to set foot on an airplane. O'Keefe's observations about law blogging have shaped much of the FutureLawyer blog. I heard him at LexThink's conference in Chicago last year, and was impressed. His ideas about law blogs in marketing should be read and discussed at every law firm. Does your firm have a blog? This post is being written on the ThinkOutside Infrared Stowaway keyboard ThinkOutside Stowaway IR Keyboard, which is a full-sized, though tiny keyboard, that allows touch typing to my T-Mobile MDA smartphone. With the addition of the ability to type normally, I may finally be able to leave the notebook computer at home most of the time. The small space bar and function keys takes some getting used to, but the computer makes a cool typewriter click sound when the keys are pressed, and the travel is deep enough for a satisfying typing experience. You really need to be a touch typist to use these things; however, if you are, they are a valuable addition to the arsenal. The Stowaway infrared is only $69, while the BlueTooth version is $129. I passed on the BlueTooth, even though the T-Mobile is a bluetooth enabled phone. Word Mobile is a great little word processor as well, and the look and feel is just like its big brother. I still like WordPerfect better, though. 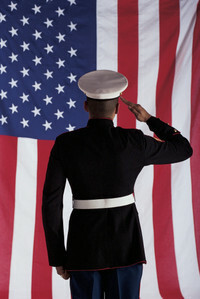 Link: THE HISTORY CHANNEL - Memorial Day. Today is a day to remember. Today is a day to understand. Today is a day to be grateful for those who made the ultimate sacrifice.This wonderful resource from the History Channel is a great place to start this day. Thank You seems like such a feeble response to those who died in the service of our country. Link: Micrologics / Library / ActiveSync Toggle. I love my T-Mobile MDA phone. I also love Windows Mobile 5.0 (most of the time). I even find the sync software Microsoft provides, ActiveSync, easier to use, and more automatic than HotSync for Palm products. However, in the Microsoft way, Redmond thinks they know best, and refuse to allow ActiveSync to be unloaded from memory, and it runs every time the system starts. It sits in the System Tray, patiently waiting for any change in my data, and immediately syncs it to the smartphone. This is okay sometimes, but it takes system cycles, and sometimes is a pain. Why can't Microsoft trust me to exit from ActiveSync, and then load it again when I am ready? So, this third-party app from Micrologics, which is a free download, is a great addition to the toolbox. When I disconnect my phone from the cradle, it allows me to unload ActiveSync, and ActiveSync won't start again until I turn it on. What a feeling of power! What a feeling of control! Take that, Microsoft. And, thank you, Micrologic. Link: Some cell phone owners spurn gadgetry - Yahoo! News. It must be something in the water. 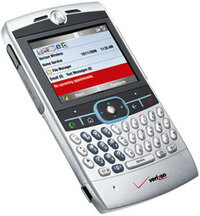 Now, we are told that some cell phone users just want a cell phone, not a phone/PDA/media/email/web marvel. If you read this blog, you know that is not me. I want my smart phone to bring me coffee in the morning. But, I respect the rule that the best design is a product that does one thing, and does it well. The problem is that there are so many things we want our appliances to do nowadays, it is impossible to carry them all with us. So, I am willing to make little compromises in order to have a multi-functioning product. And, I confess, I enjoy tinkering with the software and hardware. Some guys tinker in the garage. I prefer clean hands, Air Conditioning, a cool beverage and the LazyBoy...all while tinkering with my smartphone. But, to each his own. I have inserted a photo of what this guy seems to want. It just does phone, and does it well. But, it weighs 50 pounds, it is sturdy, and you carry it around in a rolling cart. This is what cell phones would still look like if the Luddites had their way. Progress is such a pain. Link: Motorola Q review by PC Magazine. Here is a detailed review of the new Moto Q, which, I assure you, I am buying myself for Father's Day. The Q will probably replace my wonderful T-Mobile MDA; but, I may just alternate, since the Q is not getting high marks for video playback, and has a smaller screen. However, it is SO COOL. I can't afford a Ferrari, and this is the next best thing. It will combine the one-handed operation of the Treo with the Windows compatibility of the T-Mobile MDA, and the slimness of the RAZR. What's not to like? Link: GoToMeeting : Web conferencing, Online Meetings In keeping with my recent "Have Computer, Will Never Travel" motif, I present Citrix' GoToMeeting Web meeting service. In the past, stiff session pricing models priced this great tool out of the market. Recently, I was offered a trial of the new $49 a month, all you can eat, service model, and I report that I love it. This software sits in your task bar until you need it. 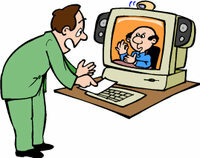 The host calls a meeting, and notifies participants of the web location by phone or email. Participants login with a secure code, and, presto, everyone is sharing the same screen, participants can chat online, Skype users can talk to each other, the host can transfer control of the screen to anyone, and, if you have a vidcam, you can see the participants live. I swear, there is no more excuse to own an automobile. I think I will become a hermit in my den, and just have my wife bring me food every now and then. You know, she will LOVE that. Who wants to have a meeting? Seriously, we should be doing Motion practice with this software. Now, we just have to get the Judges to use it. My recent column on traveling the world on the Internet has generated some buzz. It occurred to me that there should be a place where lawyers and interested persons could go as a resource for the best virtual travel on the net. So, with some pride, I have created LegalNetTourist - Link . I envision a place where we can all meet at a virtual water cooler, and tell each other about the cool virtual places we have visited. The difference is that, while typical tourists bring back photos, and bore everybody to death, we can now let everyone know how to visit those cool places on the web. Check it out. Check out the article at Law.Com - Legal Technology, and, if you know of a cool place on the web, or a webcam that everyone might like to see, post a comment.